LOCATION: 828 North Coast Highway 101, Suite E ZONING/OVERLAY: The subject property is located in the North 101 Corridor Specific Plan- Commercial Mixed-1 (N-CM-1) zone and the Coastal Zone. PROJECT DESCRIPTION: Continued public hearing to consider a Minor Use Permit Modification and a Coastal Development Permit for an existing private club to provide beer, wine, and spirits (Type 57 ABC License) service to its membership. ENVIRONMENTAL STATUS: The project is exempt from environmental review pursuant to the California Environmental Quality Act (CEQA) Guidelines. 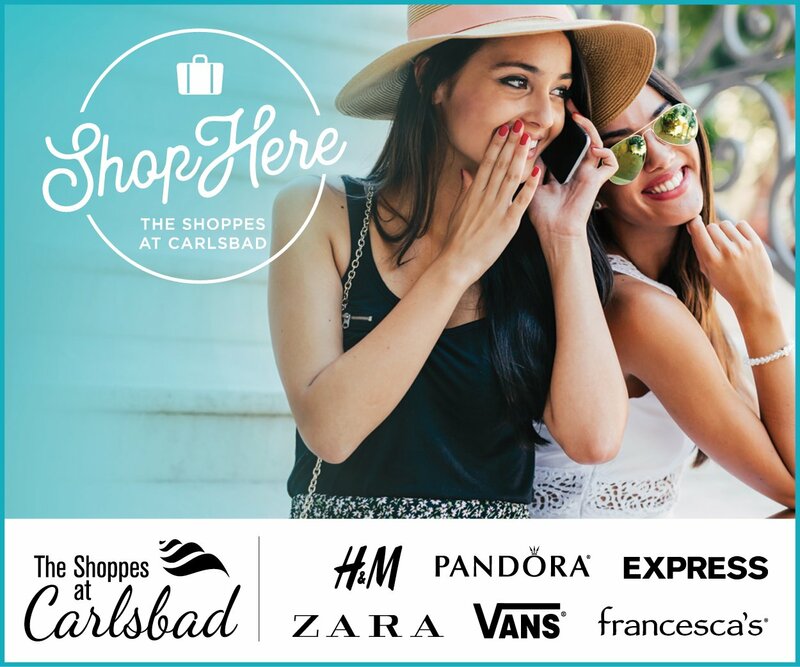 STAFF CONTACT: J. Dichoso, Associate Planner: (760) 633-2681 or jdichoso@encinitasca.gov 3. PROJECT NAME: San Elijo Joint Powers Authority Reclamation Outfall Project CASE NUMBER: 15-314 MUP FILING DATE: January 12, 2016 APPLICANT: San Elijo Joint Powers Authority LOCATION: 2695 Manchester Avenue (APNs: 261-010-13-01; 261-191-04; 261-191-03 and -04, 261-191-07, 261-190-38, 261-190-49, 261-172-05 and -21; 261-171-07 and -08) ZONING/OVERLAY: The subject property is located in the Public/Semi-Public (P/SP) Zone, Ecological Resource, Open Space and Parks (ER/OS/PK) Zone, Transportation Corridor (TC) Zone, Floodplain Overlay Zone, Scenic/Visual Corridor Overlay Zone and the California Coastal Commission’s Appeal Jurisdiction of the Coastal Zone. PROJECT DESCRIPTION: Public hearing to consider a Major Use Permit application for the replacement and realignment of a section of the existing San Elijo Water Reclamation Facility Outfall System from Manchester Avenue, the Nature Center parking lot, San Elijo Lagoon and terminates on Cardiff State Beach. 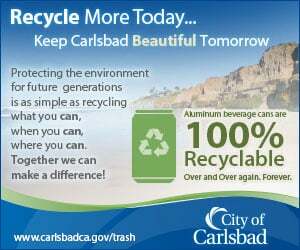 ENVIRONMENTAL STATUS: A final Mitigated Negative Declaration has been adopted by the San Elijo Joint Power Authority. STAFF CONTACT: Andrew Maynard, Associate Planner: 760-633-2718 or amaynard@encinitasca.gov 4. PROJECT NAME: Helvetica Chesterfield CASE NUMBER: 14-168 DR/PMW/CDP FILING DATE: July 15, 2014 APPLICANT: Helvetica Chesterfield 22, LLC. LOCATION: 464 Chesterfield Drive (APNs: 260-412-17, -18 and -19) ZONING/OVERLAY: The subject property is located in the Residential 11 (R-11), Scenic/Visual Corridor Overlay Zone and the Coastal Zone. PROJECT DESCRIPTION: Public hearing to consider a Design Review Permit, Parcel Map Waiver and Coastal Development Permit application for the demolition of an existing residence and the construction of a new single-family residence and two sets of twin homes (4 dwelling units). The Parcel Map Waiver is to consolidate two underlying legal lots (Lots 23 and 24) into one legal lot for the new single-family residence. ENVIRONMENTAL STATUS: The project is exempt from environmental review pursuant to the California Environmental Quality Act (CEQA) Guidelines. STAFF CONTACT: Andrew Maynard, Associate Planner: 760-633-2718 or amaynard@encinitasca.gov 5. PROJECT NAME: Ames Residence CASE NUMBER: 15-102 V/CDP FILING DATE: April 21, 2015 APPLICANT: Cathy Ames LOCATION: 1044 Hygeia Avenue (APN 254-325-05) ZONING/OVERLAY: The project site is located in the Residential 11 (R-11) zone and the Coastal Zone. PROJECT DESCRIPTION: Public hearing to consider a Variance and Coastal Development Permit for a remodel/addition to an existing single-family home. A Variance is requested for a bridge within the front yard setback for access to the home. ENVIRONMENTAL STATUS: The project is exempt from environmental review pursuant to the California Environmental Quality Act (CEQA) Guidelines. STAFF CONTACT: J. Dichoso, Associate Planner: (760) 633-2681 or jdichoso@encinitasca.gov 6. PROJECT NAME: Kovner Duplex Addition CASE NUMBER: 15-160 DR/CDP FILING DATE: June 16, 2015 APPLICANT: Damien Kovner LOCATION: 810 and 812 Dewitt Avenue (APN 258-213-02) ZONING/OVERLAY: The project is located within the Downtown Encinitas Specific Plan and zoned Residential 11 (DR-11) and in the Coastal Zone. PROJECT DESCRIPTION: Public hearing to consider a Design Review Permit and Coastal Development Permit for a remodel/addition to an existing duplex. ENVIRONMENTAL STATUS: The project is exempt from environmental review pursuant to the California Environmental Quality Act (CEQA) Guidelines. WHEREAS, the errata corrects this clerical error on an incorrect map affecting what is known as Viable Housing Site ALT-7 to accurately depict the decision of the City Council; WHEREAS, the correct area to be rezoned as At Home in Encinitas is accurately depicted and described in multiple places of the project record and evidence, including but not limited to the following, all of which are on file with the Office of the City Clerk and incorporated herein by reference: a. The large scale illustrative map for the Sustainable Mixed Use Places/Environmentally Superior Alternative. b. 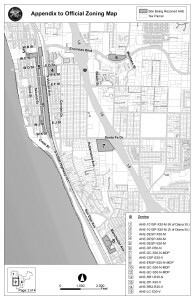 A parcel-specific map in Appendix “B” of the Environmental Assessment/Environmental Impact Report that exactly depicts all of the parcels in Viable Housing Site ALT-7 to be rezoned At Home in Encinitas. c. The Environmental Assessment/Environmental Impact Report describes the Sustainable Mixed Use Places housing strategy map alternative in Chapter 9 Project Alternatives and accurately depicts the parcels included with fine detail (Figure 9-3) and moreover it is described in Chapter S.0 Executive Summary. d. The Sustainable Mixed Use Places housing strategy map alternative was based upon the Modified Mixed Use Places (MMUP) housing strategy map alternative. City Council created the MMUP during a public hearing on February 5, 2015 and in doing so, expressly created the site known as Viable Housing Site ALT-7, a new collection of parcels that the City Council expressly identified for study in the Environmental Assessment/Environmental Impact Report. ALT-7 is described throughout the Environmental Assessment/Environmental Impact Report. e. A description of the adequate sites inventory in the 2013 – 2021 Housing Element. f. The sites were accurately disclosed in both public notices mailed pursuant to Encinitas Municipal Code Chapter 30.00. WHEREAS, the City Council fully and accurately understood what it was deciding, as demonstrated by the following examples: a. The Council adopted the Sustainable Mixed Use Places/Environmentally Superior Alternative, as described in the Findings of Fact in the Environmental Assessment/Environmental Impact Report, pursuant to Resolution No. 2016-51. b. The Council asked and was answered by subject matter experts on the City’s project team during the June 15, 2016 public hearing that it could not add or remove sites from any of the housing strategy map alternatives studied in the Environmental Assessment/Environmental Impact Report. c. The only modification that the City Council made to the recommended project was to limit the maximum building height of buildings in the Cardiff Town Center area, known as Viable Housing Site C-3, to a maximum of two stories. d. The City Council itself created what is known as Viable Housing Site ALT-7. WHEREAS, one map sheet out of the totality of the record and evidence does not correctly reflect the City Council’s decision; WHEREAS, the required six-week Notice of Availability review period for the Local Coastal Program Amendment started on April 29, 2016 and concluded on June 10, 2016. 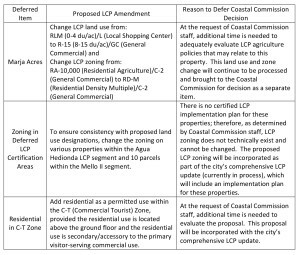 The proposed errata corrects a clerical error only and since it does not change the Council’s decision regarding the Housing Element Update program, this errata action is not subject to additional availability as provided for under the Coastal Act; WHEREAS, pursuant to law, the City provided a Notice of City Council Public Hearing and published the Notice of Public Hearing on July 8, 2016, in the Coast News; WHEREAS, the City Council did on July 20, 2016, hold a duly noticed public hearing as prescribed by law. Evidence was submitted to and considered by the City Council, including, without limitation, the totality of the record and evidence it relied upon in making its decisions on June 15 and June 22, 2016 regarding Resolution No. 2016-51, Resolution No. 2016-52 and Ordinance No. 2016-04. NOW, THEREFORE, the City Council of the City of Encinitas, California, hereby ordains as follows: SECTION 1. The foregoing recitals are true and correct, and are hereby adopted for the record. SECTION 2. This action involves correcting a clerical error on a map to accurately reflect the information in the Environmental Assessment/Environmental Impact Report (SCH #2015041044) and is not a project as defined by California Environmental Quality Act (CEQA) Guidelines Section 15378. If it was a project, it would be exempt from environmental review under the “General Rule” pursuant to CEQA Guidelines Section 15061(b)(3). SECTION 3. The second of four map sheets in Exhibit 2016-04-2, Appendix to Official Zoning Map, in Ordinance No. 2016-04, which is an incorrect map, shall be replaced with a corrected map to accurately depict the decision of the City Council, as shown in Exhibit “A”, attached hereto and hereby made a part hereof. Exhibit “B” is the incorrect map being replaced. SECTION 4. This Ordinance was introduced on July 20, 2016 and published in full on Friday, August 5, 2016 in The Coast News. PASSED AND ADOPTED this 27th day of July, 2016 by the following vote to wit: AYES: Blakespear, Gaspar, Kranz, Shaffer NAYS: None ABSTAIN: None ABSENT: Muir /Kristin Gaspar, Mayor City of Encinitas ATTESTATION AND CERTIFICATION: I hereby certify that this is a true and correct copy of Ordinance No. 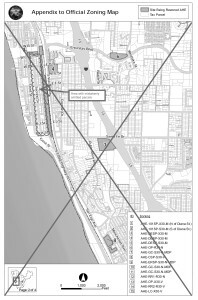 2016-06 which has been published pursuant to law./Kathy Hollywood, City Clerk Exhibit “A” Corrected map sheet 2 to show precisely the boundaries of the areas rezoned as At Home in Encinitas. This correction replaces map sheet 2 of 4, Appendix to Official Zoning Map, in Exhibit 2016-04-2 of City Council Ordinance No. 2016-04, on file in the Office of the City Clerk. Site ID 5 is the same as Viable Housing Site ALT-7 referenced in this Ordinance.